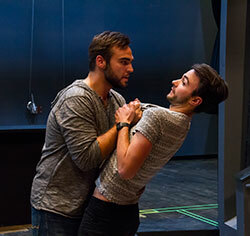 The University of Wyoming Department of Theatre and Dance will open the season with William Shakespeare’s “The Comedy of Errors.” The production runs Sept. 27-Oct. 1 at 7:30 p.m. and Oct. 2 at 2 p.m. in the Buchanan Center for the Performing Arts Thrust Theatre. Individual ticket prices are $7 for students, $11 for senior citizens and $14 for the public. UW Department of Theatre and Dance season tickets cost $82 for the public and $62 for senior citizens (60 and over). Tickets can be purchased by visiting the Performing Arts box office or the Wyoming Union information desk, by calling (307) 766-6666 or going online to www.uwyo.edu/finearts. “The Comedy of Errors” is directed by Kevin Inouye, UW Department of Theatre and Dance assistant professor. The play -- one of Shakespeare’s first and most beloved works -- is a madcap adventure of mistaken identity that combines farce, slapstick humor and romance. Building off a translation of the Roman play, “The Menaechmi,” Shakespeare pushes the farcical form to its limits, beginning with two sets of identical twins who are tragically separated as infants by shipwreck, only to be reunited by chance, sporting identical names and attire in Ephesus, a town renowned for sorcery. When Antipholus and Dromio, of Syracuse, arrive in the city of Ephesus, everyone seems to know them. Women shower Antipholus with affection, while men shower him with money and jewels. Meanwhile, the confused Antipholus and Dromio of Ephesus find themselves shunned by their acquaintances and accused of acts they did not commit. What results is a riotous maze of mistaken identities, pilfered jewels, an impending execution, a jealous wife, an angry courtesan, an exorcism, and general mayhem and hilarity compressed into one of Shakespeare’s most compact plays. “The Comedy of Errors” reveals what were to become recurring themes in Shakespeare’s works: his unfailing fascination with identity and his penchant to mingle tragic situations with comedic resolutions. Filled with double entendre and spirited wordplay, the play continues to be one of the most enduringly popular and retold tales in the Shakespeare canon.